The April 2017 issue of Cry Me A Torch Song – The Video Version. Piers Ford reviews albums from Betty Buckley (Story Songs: “Adventurous in her song choices and fearless in her commitment to them”), Sound of the Sirens (For All Our Sins: “A wonderfully cohesive, mature sound which will hold its own on the global stage”), Anna Coogan (The Lonely Cry of Space & Time: “Yma Sumac meets Americana… a sweeping, arresting exploration of the state of the world”), Patricia Kaas (Patricia Kaas: “Polished, expertly crafted chansons, full of complex, subtle emotions”), and catches up with Songs of Separation (“A celebration of the female voice, but also a resonant, bold statement for our times”). I wonder if I was the only one whose heart sunk just a little with the release of Barbra Streisand’s commercially fail-proof duets album. Not because there would be any doubt about the quality – which is as clinically polished and pitch-perfect as we’d expect – but because this great, great artist is treading such predictable water at a time when other mature singers are forging ahead into new territory. 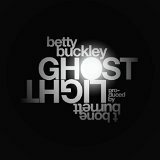 Cue – and all hail – Ghostlight, the shimmering, moody new album from Texas’s finest, Betty Buckley, which sounds positively experimental in comparison. There has always been a freedom in Buckley’s song choices that, while paying glancing obeisance to her status as a Broadway leading lady, suggests an independence and elegant wilfulness. She has never been a conventional belter, and in this eclectic selection of standards, torchy ballads and soft rock and country songs, she takes some of the most familiar lyrics in the American songbook to darker, outlying terrain – exposing them to the ghostlight of the title and stripping them back to a kind of minimalist perfection. She is joined in her quest by producer T Bone Burnett, a life-long friend, who is responsible for the album’s stark, spacey beauty. Looking back to a review I wrote of her 1993 record Children Will Listen for The Gramophone Good Musicals CD Guide, I note my remark that Buckley is “Refreshingly unafraid to try something different… [her] voice is unusual – husky and intense – often falling away almost to a murmur…” I would change little about those observations today, beyond adding that the years have simply brought greater depth and resonance to her interpretations. She never forces the issue – as these beautiful versions of “Body and Soul”, Bewitched” and “This Nearly Was Mine” aver, pressing all the right emotional buttons without ever going over the top. Heartbreak is only a note away. “Lazy Afternoon” takes on an extraordinary air of mystery, hinting that anything could materialise out of the haze. But the most interesting tracks fall in the album’s second half. There’s a sublime take on the Jefferson Airplane number “Comin’ Back to Me”, with its exquisite string arrangement, a poignant “Take it With Me When I Go”, and an honest, lyrical reading of Mary Chapin Carpenter’s “When Time Stands Still”. Effortlessly majestic. You don’t hear too many voices like Mary Carrick’s in popular music these days, beyond the boundaries of operetta or traditional musical theatre. Her clear, mellifluous soprano might not quite have the resonance of, say, Audra McDonald’s, but it is pleasingly elegant and molten – and all the more refreshing for its lyrical clarity in an age when diction in singing doesn’t always seem to be a priority. In her technique, Carrick harks back to the intimate, low-key drama of the great Helen Morgan and her sister torch singers of the 1920s and 1930s. 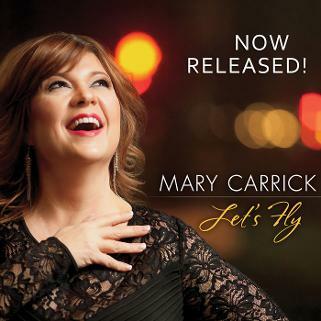 At first glance, Let’s Fly looks like another album of standards. And in a crowded market, your instinctive response is to ask, what’s different about this one? The answer lies in Carrick’s clever song choices. The old-school standards – “Come Rain or Come Shine”, a mash-up of “I’m So Lonesome I Could Cry” and “In the Wee Small Hours of the Morning”, and Cole Porter’s “So in Love” are deftly handled to be sure, but they are mainly the cornerstones of a record which celebrates more contemporary song-writing talents. And the contrast is fascinating. The album opens with the delicious fatalism of Leonard Cohen’s “Dance Me to the End of Time”, and takes in Jason Robert Brown (“Stars and the Moon”) and Stephen Schwartz (the sublime “Meadowlark”) – all holding their own alongside the masters of the American songbook. Carrick really nails her singing colours to the mast at the heart of the set with two numbers. The first, an impassioned take on Joni Mitchell’s “Both Sides Now” confirms that wistful ballad as one of the great pop songs of the 20th century. The second, a sizzling interpretation of Barry Manilow’s “Man Wanted”, is a reminder that he, too, is one of the finest songwriters of our time. The final number, an echoing, sweeping version of Craig Carnelia’s “Flight” is a moving and inspirational note on which to end. It takes a singer with Carrick’s vision and a passion for story-telling to weave songs like this into compelling and unexpected combinations. And she succeeds with the help of a fine band – three of whom, pianists J.Gawf, Todd Brooks and Eric Andries, also take credit for the pristine arrangements.